Description: This is a great drill done indoors without the distraction of a target. It will help you develop feel for returning your putter face back to square. 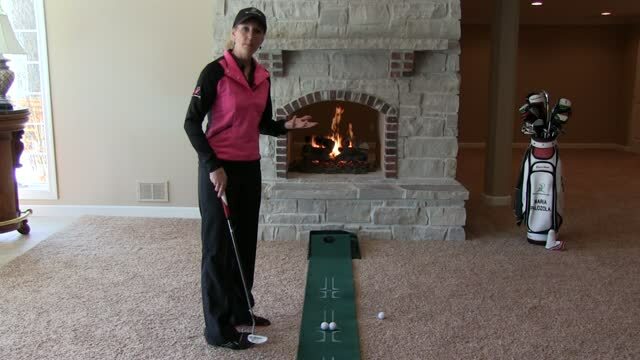 Set up on carpet, a wood floor or a putting tarp and place two balls together (one in front of the other, both equidistant from the hole and touching each other). Next, practice making putts and if both balls roll straight you know you are returning with a square face. Note that if you are a person who has trouble blocking or pushing putts that you may want to practice making the outside ball roll further. This will assure you that you are closing the face (allowing the toe of the putter to arrive first) through impact and off set the feel of leaving it open. Practicing the 2 Ball Drill through the winter months will help you develop feel for what it's like to return your putter face squarely to the ball.